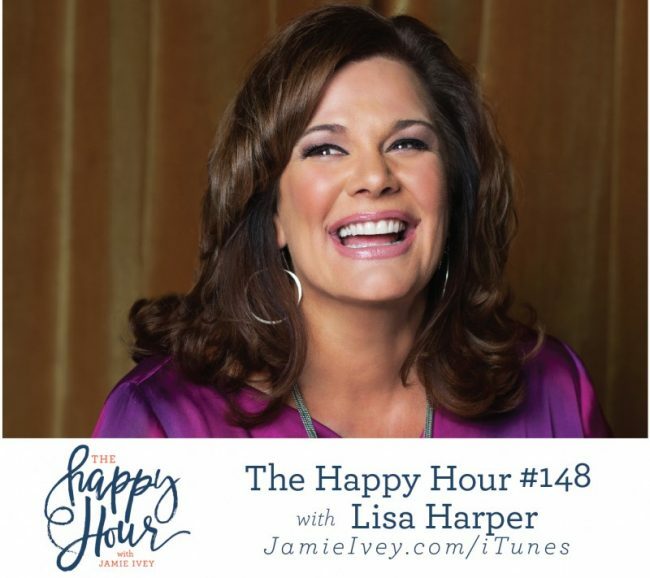 My guest for The Happy Hour #148 is Lisa Harper. Lisa is a master storyteller with a masters of Theological Studies from Covenant Seminary. She’s lauded as an engaging, hilarious communicator as well as an authentic and substantive Bible teacher. She’s been in vocational ministry for thirty years and has written fifteen books and Bible study curriculums but says her greatest accomplishment by far is that of becoming Missy’s (her adopted daughter from Haiti) mama! They live on a hilly farmette south of Nashville, Tennessee, where they enjoy eating copious amounts of chips, queso, and guacamole. And then diving in the pool immediately afterwards instead of dutifully waiting the recommended thirty minutes. Oh my gracious, getting to talk with Lisa was such a delight. You guys are going to love her so much. Other than the fact that I forgot to press record at the beginning of our conversation and missed 15 minutes of chatter, this is such a fun episode. Lisa and I chat about her newest book, The Sacrament of Happy, and the misconceptions surrounding happiness for Christians. We talk all about her adoption of her sweet little Missy from Haiti. And you'll hear her tell a story that I am certain is going to make you want to punch someone. Lisa is the best, and I know you'll love to getting to know her. Make sure to grab a copy of her book. You will not regret it.